Ding Yanyuhang of the Dallas Mavericks handles the ball during practice on Sunday at Shenzhen Universiade Center in Shenzhen. The Mavs play the Philadelphia 76ers in game two of the NBA China Games 2018 tonight in the Guangdong city. Ding-sanity is helping the Dallas Mavericks strengthen their ties to the Chinese market. 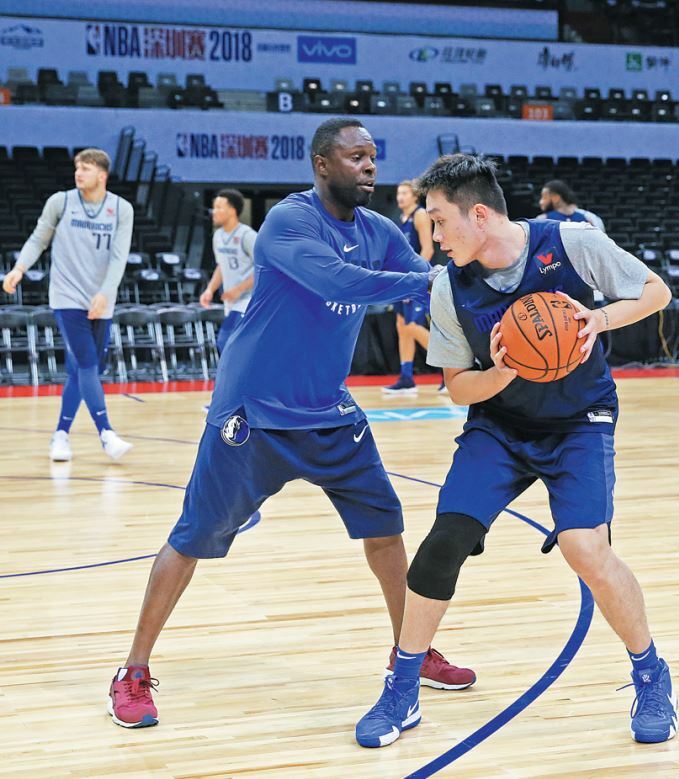 The Mavs looked to 25-year-old Chinese forward Ding Yanyuhang to deepen their connection to the country by carrying him on the roster for their preseason visits to Shanghai and Shenzhen for the China Games against the Philadelphia 76ers. Ding's affiliation with Dallas since playing for the Mavs in last year's summer league has raised hopes of seeing another Chinese player join Houston Rockets' 2016 second-round draft pick Zhou Qi in suiting up for a regular season game. However, right knee tendinitis that first surfaced during April's China Basketball Association playoffs has sidelined Ding throughout training camp and kept him out of the lineup against the 76ers at Shanghai's Mercedes-Benz Arena on Friday. Still, Ding received rousing applause from the sold-out crowd when his name was announced during the pregame introductions. During halftime, another huge ovation welcomed Wang Zhizhi, who was drafted by the Mavs in 1999 and went on to become the first Chinese to play in the NBA. "We love Ding as a player," Mavs head coach Rick Carlisle said after Philadelphia's 120-114 victory. "He's a great ambassador for China, but the first thing he needs to do is get healthy. "He's a terrific player and has great energy and enthusiasm for the game. After being around him quite a bit last year, I understand why he is so popular in China." During last year's summer league in Orlando and Las Vegas, Ding's energetic play endeared him to fans and created a buzz that some compared to "Linsanity"－the hype surrounding Chinese-American guard Jeremy Lin after his unexpected breakout performance with the New York Knicks in 2012. Dennis Smith Jr, who also played in the summer league last year after being drafted ninth overall by the Mavs, said Ding's game is entertaining. "There was a lot of excitement in the building every time he touched the ball. He is a high-energy player at both ends of the floor," said Smith, a member of the NBA All-Rookie second team. "He understands how to score. I'd like to have him on the team." Ding, who represented China at the 2016 Rio Olympics, is the reigning MVP in the CBA, winning the award back-to-back in 2017 and 2018. Last season with Shandong, he averaged 26 points, 5.3 rebounds, 3.2 assists and 1.6 steals in 45 games. Meanwhile, 13-time NBA All-Star Dirk Nowitzki believes that keeping an eye on other talented Chinese players will only benefit the Mavs' efforts to make further inroads here. "It all started with Wang Zhizhi, who is a good friend of mine," the German former league MVP told Tencent. "It was a great beginning to the relationship between the Mavs and China, and we've kept close with Wang. "Now with Ding, it seems to be continuing. If his health is OK, he will have a shot in the league." Nowitzki, who is preparing for his 21th season as a Maverick, is hugely popular with fans in China, having played in the 2008 Summer Olympics in Beijing. The 40-year-old was mobbed everywhere he appeared in Shanghai. "It's like a zoo or a circus," veteran guard Wesley Matthews said of the throng of fans looking to catch a glimpse of Nowitzki at the team's hotel. "The hotel guests can't love it. If you are in your room, you know when Dirk walks in and out of the building." Mavs view Chinese forward as both player and ambassador.